Julian Huxley wrote, “God does not in fact exist, but act as if He does!” Woody Allen addressed the same point in his movie CRIMES AND MISDEMEANORS and I have written this same subject over and over and over again on this blog. In both the East and the West, however, there are attempts to relieve the tension of seeming to be nothing, while in fact being something very real – a person in a real world which has a definite form. 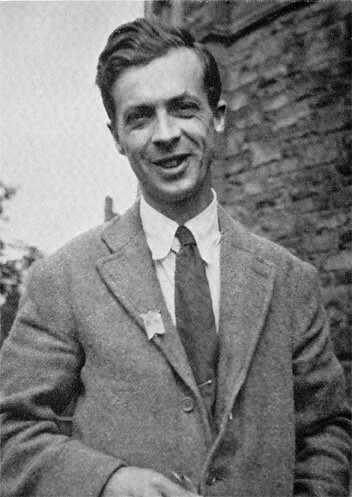 On the materialist side, Sir Julian Huxley (1887-1975) has clarified the dilemma by acknowledging, though he was an atheist, that somehow or other – against all that one might expect – a person functions better if he acts as though God exists. “So,” the argument goes, “God does not in fact exist, but act as if He does!” As observed by the Norwegian playwright Henrik Ibsen (1828-1906) in The Wild Duck: “Rob the average man of his life-illusion, and you rob him of his happiness at the same stroke.” In other words, according to Huxley, you can function properly only if you live your whole life upon a lie. You act as if God exists, which to the materialist is false. At first this sounds like a feasible solution for relieving the tension produced by a materialist world-view. However, a moment’s reflection shows what a terrible solution it is. You will find no deeper despair than this for a sensitive person. This is no optimistic, happy, reasonable, brilliant answer. It is darkness and death. Another way the tension is relieved is through the theory of evolution, the idea that by chance there is an increasing advance. People are given an impression of progress – up from the primeval slime and the amoeba, up through the evolutionary chain, with life developing by chance from the simple carbon molecule to the complex, right up to the pinnacle, mankind. This is not the place to discuss evolutionary theory, but it surprises us how readily people accept it, even on the scientific side, as if it had no problems. There are problems, even if these are not commonly realized or discussed.89 The primary point we are interested in, however, is not evolution itself but the illusion of “progress” which has been granted by it. By chance, this amazing complexity called “man” has been generated out of the slime. So, of course, there is progress! By this argument people are led into imagining that the whole of reality does have purpose even if, as we have said, there is no way that it really can have purpose within the humanistic world-view. Evolution makes men and women feel superior and at the top of the pile, but in the materialistic framework, the whole of reality is meaningless; the concept of “higher” means nothing. Even if, within the humanist world-view, people are more complex than plants and animals, both “higher” and “lower” have no meanings. We are left with everything being sad and absurd. Thus, the concept of progress is an illusion. Only some form of mystical jump will allow us to accept that personality comes from impersonality.90 No one has offered to explain, let alone demonstrate it to be feasible, how the impersonal plus time plus chance can give personality. We are distracted by a flourish of words – and, lo, personality has appeared out of a hat. Imagine a universe made up of only liquids and solids, one containing no free gases. A fish is swimming in this universe. This fish, quite naturally, is conformed to its environment so that it is able to exist quite happily. Let us suppose, then, that by blind chance (as the evolutionists would have us believe) this fish developed lungs as it continued swimming in this universe without any gases. The fish would no longer be able to function and to fulfill its position as a fish. Would it then be “higher” or “lower” in its new state with lungs? Obviously it would be lower, for it would drown. In the same way, if a person has been kicked up from the impersonal by chance, those things that make him a person – hope of purpose and significance, love, notions of morality and rationality and beauty – are ultimately unfulfillable and are thus meaningless. In such a situation, is man higher or lower? Mankind would then be the lowest creature on the scale, the least conforming to what reality is. Thus we see how hopeless is the illusion of meaning or purpose as derived from evolutionary thought. Many excellent arguments have been advanced throughout the years on behalf of Christian theism: the cosmological, the historical, the teleological, and so forth. One of them, the moral argument, by reason of its extreme relevance to the human situation, has a certain advantage over the others. Although like them it supplies grounds for believing in a transcendent, personal God, the moral argument goes further. It addresses itself to a most fundamental question which concerns humanists and Christians alike. Both groups are eager to sustain an ethic or moral obligation to our fellow man. But on what basis does such a noble commitment securely rest? How is it to be sustained, or even explained? The moral dimension of human experience raises very readily the question of God whom Christians believe constitutes the only ground that can support the kind of moral commitment which is needed today. In his convocation address to the Darwin Centennial celebration, Sir Julian Huxley put forward a naturalistic ethic based upon his evolutionary vision of the world. Man’s hope depends, he argued, upon his ability to generate human values and guide the course of his own development. How can this be done? Let us observe the direction we are developing, and from that decide in what direction we ought to be moving. In agreement with D.H. Waddington, Huxley defined what is right and ethical as activity which is in conformity to the evolutionary process. There are three decisive weaknesses which, quite apart from Christian revelation, are immanent within this proposal. First, Huxley has committed the “naturalistic fallacy” as set out by G.E. Moore. Moore held that ethical concepts cannot be reduced to, or derived from, non-ethical concepts. It is not possible to derive an ought from an is. Although Huxley is anxious for us to believe that his ethics arise out of his science, they do not in fact do so. On the contrary, they were derived from elsewhere, and by a process of circular reasoning were read back into it. When we look at evolution, for example, we see the principle of the “survival of the fittest” which, if it were translated into ethical terms, could only justify an ethic of power and selfishness which Huxley could not endorse. Science by itself is incapable of generating values, and just because it is value-free stands in need of an axiology from the outside to direct its own work. Naturalistic ethics are parasitic. They are unconsciously imbibed out of the general heritage of Western civilization, and put forward as if they arose out of a description of the world. These prior commitments are what lead men like Huxley to accept certain aspects of evolution, and ignore others. Second, once we see that the norms of naturalistic ethics do not spring from the world of nature, we can realize how very arbitrary this approach to ethics is. The only way to sustain a neighbor-oriented ethic on these terms is by arbitrarily positing the value of human personal life by an act of the will. There is no objective reason within a naturalistic framework for placing value on man’s life, the starting point of any ethical system. We can illustrate the problem from within the discussion between ethicists who operate in this framework. Professor A.J. Ayer, a logical positivist, holds ethical statements to be emotive and non-cognitive. They represent a personal preference for a certain kind of behavior, rather than any objective ethical norms. We can no more criticize a person for liking to steal than we could condemn him for preferring coffee to tea. On the American scene, Miss Ayn Rand has attained some notoriety for espousing the virtue of selfishness. If the ego alone has value, as naturalism would seem to imply, self-interest is the final norm for human behavior. Man’s sole significant ethical obligation is to himself. Similarly Jean Paul Sartre, though he has given much thought to the subject, has been unable to develop reasons or norms for man’s moral responsibility towards his neighbor. We allude to Ayer, Rand, and Sartre, in order to show that there is a crisis of values in the naturalistic world view which deeply threatens the foundations of ethics. Though we are profoundly interested in attempts of humanists to develop an ethic of goodwill towards all men, we cannot see how this will be possible. Humanists can decide to recognize the worthwhileness of human life, but are unable to explain why we are obliged to. Finally, naturalistic ethics consistently ignores one of the best attested facts about human nature, its moral obtuseness and perversity. At no point is the humanist creed which counts upon the goodness of man less convincing. Man’s sense of moral obligation is continually being frustrated because of his self-centeredness. Science has done much for us, but it has not made us good. Naturalistic ethics are deficient because they do not take into account this undoubted fact about human beings. In each of these three respects, naturalistic ethics show itself to be conceptually deficient. In contrast with naturalistic ethics, the Christian system based upon belief in a personal God of righteousness makes excellent sense of the moral dimension of human experience and provides a firm foundation on which to build a neighbor-oriented ethic. First of all, the Bible gives a sufficient explanation as to the origins of morality in human life. It is surely a striking thing that out of a universe composed of atoms and molecules there should arise personal, rational, and moral creatures such as men are. What can account for this extraordinary fact? According to naturalism, personality, rationality, and morality have all arisen by chance out of impersonal, nonrational, and amoral being. The evolutionary stream appears to have risen much higher, qualitatively speaking, than its source. But any such theory falls far short of full rationality. A cause does not produce an effect which contains in itself qualities altogether lacking in the cause. If the world contains personal, rational, and moral creatures, as it does, it can only be because the cause of the world is personal, rational, and moral. Second, the Christian belief in God lays solid foundations for morality. The British language philosopher Stephen Toulmin has written a book which explores the principles which are implicit in our reasoning as moral agents (Stephen Toulmin, An Examination of the Place of Reason in Ethics, [Cambridge, 1950]). In the course of his analysis, Toulmin uncovered a fundamental commitment which, though generally unquestioned and even unrecognized, points beyond morality to something deeper. That commitment amounts to a profound confidence in the final worth of human life. If the confidence were not there, we would lack all motivation to keep faith and act responsibly toward others. Moral actions are existentially possible only because their roots reach down into an underlying confidence in the abiding worth of our lives. But how is such a prereflexive confidence to be accounted for, and on what basis does it securely rest? Certainly, naturalism cannot explain it, or supply any adequate foundation for it. If man is the chance product of an impersonal order, the final worth of his life is drastically undermined, and consequently the foundation of morality is threatened. Friedrich Nietzsche was perceptive when he saw that the death of God would bring about a transvaluation of values. Once man’s confidence in the worth of human life is cut away, the basis of the entire ethical enterprise is shaken. Only belief in God can provide the sound basis in reality for that confidence in the final worth of human life which ethics presupposes. Third, Christian theistic belief accounts better for the nature of morality, in at least two respects. In the first place, in moral experience we find ourselves confronted by an unconditional claim, one that is sovereign over all the calculations of expediency. Various psychological and social factors may provide the occasion for making moral judgments , but they do not at all produce the unconditional dimension of the moral imperative. At Nuremberg not even the ethical relativists said, “The Nazi ethical code based upon the German psychology of the thirties allowed for genocide, but our particular criteria compel us to disapprove of it.” On the contrary, the consensus was one of unconditional condemnation. Genocide is objectively wrong, and those who practice it deserve to be punished. Indeed, no mundane penalty seemed adequate for the offense. Moral experience of this kind is familiar to us all, and it is difficult to account for within a nontheistic framework. In the second place, there is reason to believe that this awareness of unconditional moral obligation involves a uniquely personal constraint. We do not feel shame or pollution when we harm things, or transgress such impersonal laws as gravitation. But we do feel that way when we violate the moral law. The proper locus of that law must reside then in a superhuman mind. Even the way in which humanists display loyalty to truth and respect for moral standards only makes sense if there is One to whom they do not wish to be disloyal. In moral experience, we know ourselves to be responsible, not to an impersonal code, but to Him who upholds a moral universe. Fourth, the Christian message is tailor-made to solve the problem of morality. The sense of moral failure is one of the best attested aspects of human experience. We consistently fall short of attaining the most elementary moral obligations. There seems to be a wide discrepancy between our inward inclinations and the moral law. What man obviously needs is divine redemption in which there is the possibility of a significant degree of righteousness in this world and a promise of perfect righteousness in the world to come. We desperately need a healing power from beyond ourselves. This condition is richly fulfilled in the Christian gospel: “For the grace of God has appeared for the salvation of all men” (Titus 2:11). Finally, the Christian faith assures us that morality will attain its final end. Morality may be man’s finest endeavor, but it is not difficult to see that it can never be fulfilled in this life. In earthly life there are degrees of goodness that are never attained, and acts of wickedness that are never requited. If this life is the only sphere of moral experience we will know, then the world is a madhouse. The lower forms of life may attain their temporal ends, but man whose moral fulfillment requires divine justice and immortality is denied his nisus of fulfillment. The moral dimension is fated to be frustrated unless it can see fulfillment beyond the mundane realm. The Christian world view and eschatology supply precisely that understanding of reality in which morality will attain its proper ends. It is our belief that naturalistic ethics can provide neither an exhaustive or satisfying account of all that is involved in moral experience. The more we reflect carefully upon this phenomenon the more we are drawn toward belief in God as the rational and intelligible goal of the moral pilgrimage. Moral experience, like human experience as a whole, is left puzzling and unclear unless rational belief in God is finally adopted. We are not maintaining, let it be noted, that the moral law possesses no power in men’s lives apart from a religious sanction. What we do maintain is that only religious belief renders the existence of the moral dimension understandable. It alone can explain what transpires in that area of human experience. Apart from belief in God, the moral order is an impenetrable mystery. Our essay began by observing how deeply relevant the moral argument for Christian theism is to the human situation. Almost everyone agrees that we need a greater degree of moral responsibility if mankind is to survive its own folly. But surely it is plain that humane values are not likely to persist if the naturalistic view of the world should become dominant. By leaving God out of the picture, secularism undermines the very foundation on which even its own ethical concerns must rest. It is totally self-stultifying. The Christian faith, on the other hand, supplies a superb basis for a truly ethical concern for other people. By all means let us dedicate ourselves to the good of all mankind. But let us do it within the framework which truly sustains so noble a commitment. Back to Contents Does God Exist?, SepOct04. Julian Huxley was the grandson of T H Huxley (staunch supporter of Charles Darwin and creator of the term “agnostic”). He continued his grandfather’s valuable work – in 1927, he joined H G Wells and his son in producing a comprehensive book called The Science of Life, which helped to spread a general understanding of evolution and to promote Biology in the school curriculum. He believed that the study of evolution could help us to understand our own nature and behaviour. He was a professor at King’s College, London, and a pioneer in the study of animal behaviour (ethology) and conservation. In 1935 he became one of the first directors of London Zoo. In the early sixties, he wrote articles about hunted and endangered species in Africa, which contributed to the founding of the World Wildlife Fund. Huxley was dedicated to finding the way to a better life and to the wider access of all mankind to such a life. After World War II, when the United Nations was set up, Huxley was appointed the first Director-General of UNESCO, the UN Education, Scientific and Cultural Organisation. Here he was able to promote world-wide education, population control and conservation of nature. “What the sciences discover about the natural world and about the origins, nature and destiny of man is the truth for religion. There is no other kind of valid knowledge. This natural knowledge, organized and applied to human fulfilment, is the basis of the new and permanent religion.” The book ends with the concept of “transhumanism”– “man remaining man, but transcending himself by realizing new possibilities of and for his human nature”. BOSTON — San Francisco artist Barry McGee has shown in museums and galleries for years, but he’s also widely known for his earlier work — on the streets. When asked about said vinyl McGee quietly explained how he wants the exhibition to feel inclusive. Among the old surfboards, skateboards and bright-colored op art surrounding us, the west coast artist is also highlighting images from the Boston chapter of his history — photographs of graffiti his friends made here in the 1990s. McGee met the Boston graffiti writers when they were students together at the San Francisco Art Institute. He recalls visiting them here and hitting the streets and T lines. “I remember being in those tunnels — running around in those — with some friends. And I remember rooftops in Cambridge,” he said. “He did a lot of stuff in my neighborhood in Cambridgeport, and it totally changed my world to see some of that firsthand and up close,” Neelon said. McGee made unsanctioned — a.k.a. illegal — tags here in the ’80s and ’90s, but at the same time the skilled draftsman, painter and installation artist had exhibitions at a Newbury street gallery and the Rose Art Museum. Neelon credits McGee with leading the ascendance of graffiti as a respected art form in the U.S., even though he suspects saying so would make the artist cringe. Fact is, back at the ICA McGee actually does cringe at this sort of talk. It’s kind of hard to tell if the soft-spoken artist is being serious, modest or coy. He swipes his angled bangs away from his eyes and paces a bit as we talk about his attraction to graffiti. McGee is definitely a provocateur, but a mild-mannered one. He’s also anti-establishment and anti-consumerism. McGee grew up in South San Francisco where his Irish American father worked on cars and his Chinese-American mother was a secretary. A lot of the artist’s work is both an homage to and critique of the city’s Mission District. Some of his iconic illustrations feature characters you might find there: down-trodden male faces tinged with anguish cover a grouping of empty, clear-glass booze bottles McGee bought from homeless people in the neighborhood. “A part of that is being a middle-aged man, which he admits all the time in a very self-deprecating, comical way,” said ICA senior curator Jenelle Porter. She coordinated McGee’s mid-career survey, which was organized by the University of California, Berkeley Art Museum and Pacific Rim Archive. Porter is a huge fan of McGee’s “lines.” She compares them to those drawn by another bay area artist, R. Crumb. The curator also acknowledges the recurring argument of “graffiti art vs. gallery art,” and sympathizes with McGee’s reluctance to be categorized. “For ages artists have wanted to very much not be one thing or the other. They absolutely want to straddle. They don’t want to be labeled — I mean, I get it,” she admitted with a little laugh. And for that, McGee is grateful. Are you into the magic of art? Just the magic of like, how did that happen? And if you’re standing in front of something and just don’t understand it, but you’re drawn to it? I think it’s one of the last things that still has a magic to it. It just appears. As it happens some new graffiti has just appeared in this town. You can see it on the back wall of the House of Blues in Boston, overlooking the Mass Pike. It’s connected to McGee’s ICA exhibition, but the artist didn’t do it himself because he said it’s officially sanctioned. Episode #176: Filmed in 2012, this “Exclusive” follows artist Barry McGee through his self-titled retrospective exhibition at the Berkeley Art Museum and Pacific Film Archive (BAM/PFA). McGee, who became interested in tagging while growing up in San Francisco, describes the excitement of putting up new tags and the rush of getting away with it. Alongside his ongoing and intimate involvement with street culture, McGee has maintained an active studio practice, which he describes as being something “completely different.” These two disparate ways of making—and showing—work meet in “Barry McGee,” which was also shown at the ICA Boston. CREDITS: Producer: Ian Forster. Consulting Producer: Wesley Miller & Nick Ravich. Interview: Bob Elfstrom. Camera: Bob Elfstrom. Sound: Doug Dunderdale. Editor: Morgan Riles. Artwork Courtesy: Barry McGee. Archival Footage Courtesy: Videograf Productions. Archival Images Courtesy: Barry McGee. Special Thanks: UC Berkeley Art Museum and Pacific Film Archive. A lauded and much-respected cult figure in a bi-coastal subculture that comprises skaters, graffiti artists, and West Coast surfers, Barry McGee was born in 1966 in California, where he continues to live and work. In 1991, he received a BFA in painting and printmaking from the San Francisco Art Institute. His drawings, paintings, and mixed-media installations take their inspiration from contemporary urban culture, incorporating elements such as empty liquor bottles and spray-paint cans, tagged signs, wrenches, and scrap wood or metal. 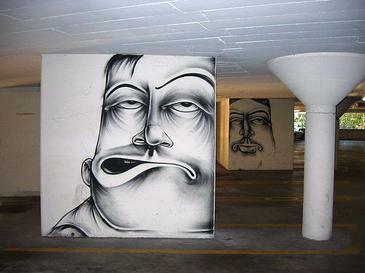 McGee is also a graffiti artist, working on the streets of America’s cities since the 1980s, where he is known by the tag name “Twist.” He views graffiti as a vital method of communication, one that keeps him in touch with a larger, more diverse audience than can be reached through the traditional spaces of a gallery or museum. His trademark icon, a male caricature with sagging eyes and a bemused expression, recalls the homeless people and transients who call the streets their home. McGee says, “Compelling art, to me, is a name carved into a tree.” His work has been shown at Walker Art Center, Minneapolis; San Francisco Museum of Modern Art; UCLA Hammer Museum, Los Angeles; and on streets and trains all over the United States. He and his daughter, Asha, live in San Francisco. « WOODY WEDNESDAY Emma Stone, Joaquin Phoenix visit park for Woody Allen film The movie is a murder mystery set on a college campus.